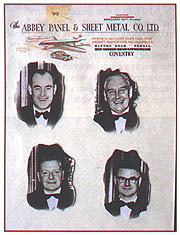 An early 50’s letterhead on which are mounted photographs of the four Abbey Panels partners of the time. All were still working on the shop floor themselves then. Top Row: Ted Loades and Les Bean. Bottom Row: Bill Woodall and Ernie Wilkinson. Ted had this hanging on his office wall at Loades Isle of Man Ltd.
Searching for better wages, and feeling he needed experience in the car industry, Ted next travelled to Coventry and worked for Carbodies (now London Taxis) before, early in 1939, transferring to Midland Sheet Metal on aircraft again. Then as the war began it was back to Coventry and AP Aircraft, ‘’working all hours, mostly with experienced car people, on sub-contract work for Nuffield, turning Spitfires out, wheeling the panels’’. Ted still felt he could improve his lot. ‘’ We were doing very well, but we knew we could do better. There was a limit after which you couldn’t earn more. You did a job at a certain price in 2.5 hours but if you did it in 2 you weren’t entitled to more, so you eased back, and we didn’t like that at all, because we were all of the same calibre, people that could manage the job.’’ Hence Ted applied for a job at Letchford Swifts in Coventry, where a more open system was applied. Some bargaining followed. ‘’They asked me what I wanted per hour, I said 2s 9d’’. ‘’We only pay 2s 6d and that’s the top rate in Coventry’’. ‘’I said I’m sorry but I want 2s 9d’’.’’ I’m afraid you can’t have 2s 9d, we don’t pay that sort of money’’. I said ‘’that’s all right’’, put my tongue in my cheek and walked out as if it didn’t matter.